It’s interesting how the air currents in my house will keep some areas relatively dust free while coating others in a blizzard of gray fluffy snow. Usually the most frightening place is under one of the living room chairs. There is a very strong possibility that tiny creatures go there to die… and by die I mean explode into a fine powdery mist. The Book of Biff #3 fun fact: The covers for all 3 books were created differently. Book #1 was drawn in Macromedia Flash, book #2 was drawn in Adobe Illustrator, book #3 was drawn in my dining room. Order your own copy today! Just one room? My entire house is like that! Theme: Cleaning up one helluva mess. Some messes clean up easy, others do take some time. My room is like that… finished basement with no airflow, 3 cats and a dog. 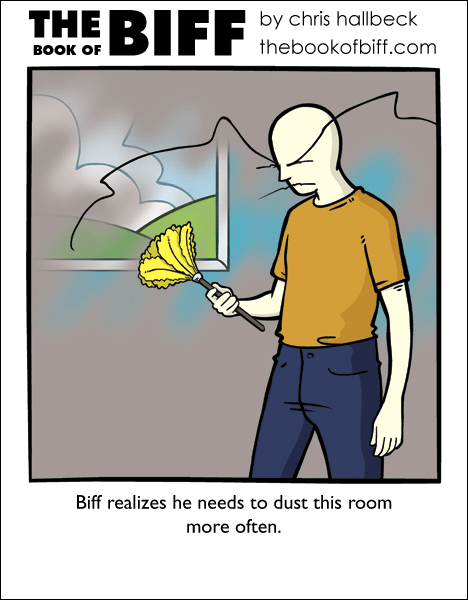 Is Biff clearing away that dust, or redoing the room in gray? Heh… Biff is to dust what I am to chaos: not much of a threat. My room’s always like that. With all the statues, my dresser and desk, all cramped into a 10’x10′ space, thick layers of dust collect weekly. I can’t keep up with it. I know how it is, the other day at work my boss told me to Dust the warehouse, and then was frightened by the black clouds stirred up when I was dusting. not looking forward to working 12-10 today though. What’s that supposed to mean…? My work gets dusted every so often. The TVs are the worst. The dust is so thick that when you use a duster it just gets spread like whiping up too much water with a single paper towel. It’s not dust, it’s insulation. Biff’s being green. Ugh, dust. Apparently the location i live in translate to ‘dust’. The dust bunnies under the couch and I have achieved dynamic ballance: I won’t dust under there, and they won’t leap up my nose and suffocate me; A sort of house-cleaning M.A.D. @speearr – The cover for book #3 was drawn with pen and ink on paper. In his dining room means that he used a fork, spoon, mac and cheese, and gravy as his tools. Guess that explains why my room needs an air filter…. eww. i’ve done that with dust too. out of it. it beats cleaning every day. i’ve been there… except with me, it was my computer, not a room. *sniffs comic* ha… ha… CHOOOO!